Last October was magical. I spent four weeks at PLAYA, an art residency program in the remote Oregon Outback. The nearest town, Paisley (population 243) was twenty miles away but had a very peaceful cemetery full of touching epitaphs and many bird motifs. I spent part of an afternoon making crayon grave rubbings on unbleached muslin. I usually use silk but I didn't have any. I didn't actually plan to use any of the grave rubbings. I just wanted to make them. When moving my studio back to my house, I was forced to consolidate some of the boxes of vintage household linens in my stash. 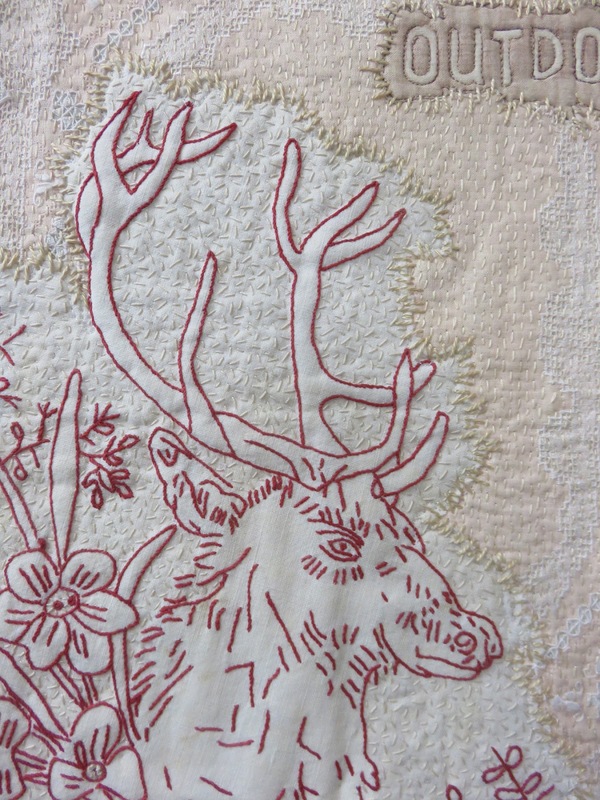 I found a lovely guest towel embroidered with red thread that depicted the head and antlers of a mighty stag. 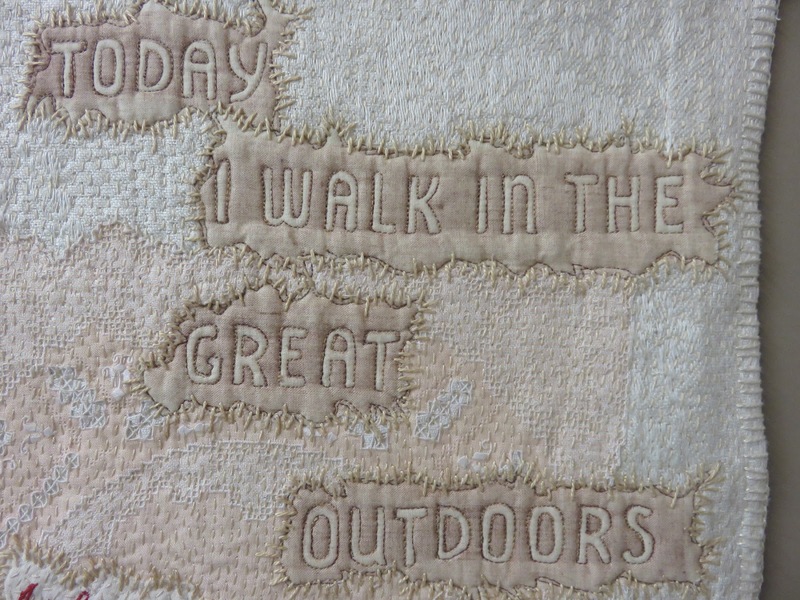 Now this isn't the sort of motif that I thought I'd ever use but it seemed absolutely perfect for one of the epitaphs made in Oregon: Today I Walk in the Great Outdoors. Then I found the hand towel with the peach colored edges and another peach colored doily. 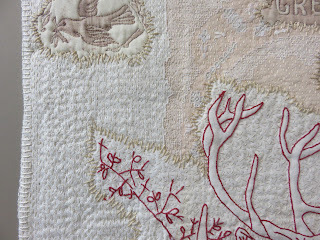 The peach color seemed to integrate the strong red embroidery. I pinned and basted the design and started stitching. Most of the work was done in the passenger seat while on the drives to recent ACC (American Craft Council) Shows. 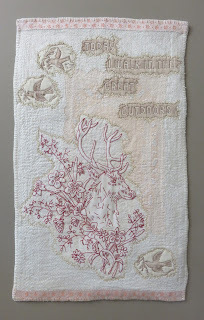 The edges of the individual pieces are all stitched with ecru perle cotton. I like the look of a "patch", a definite indication of hand stitching. 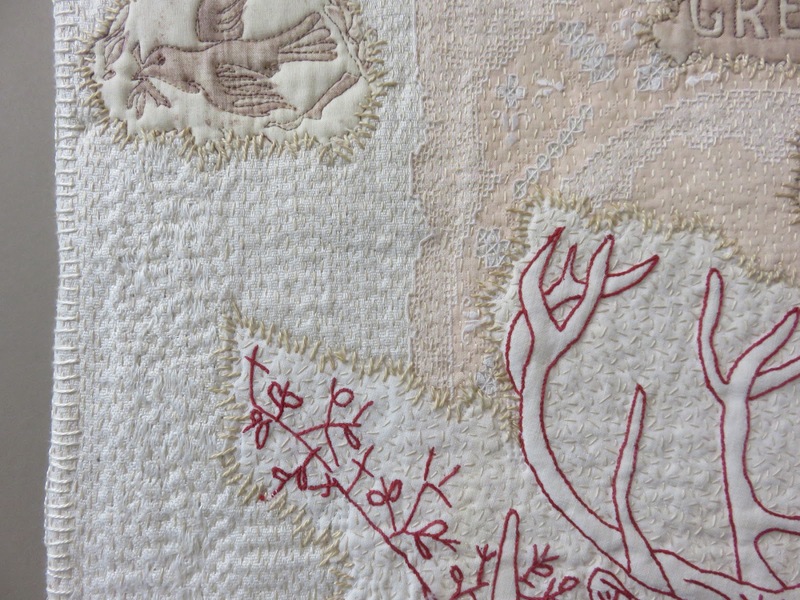 The background of the red-work is heavily seed stitched. The rest of the area, which is considerable, is densely stitched ... kantha style. Kantha stitching is really just a running stitch ... lots of them ... close together ... a textural surface. Why do I consider it "kantha" instead of plain, old "running stitch". Well, kantha is the form of quilting done by rural women in Bangladesh. Worn saris are stacked together and stitched with a running stitch ... which, by definition is "quilting". 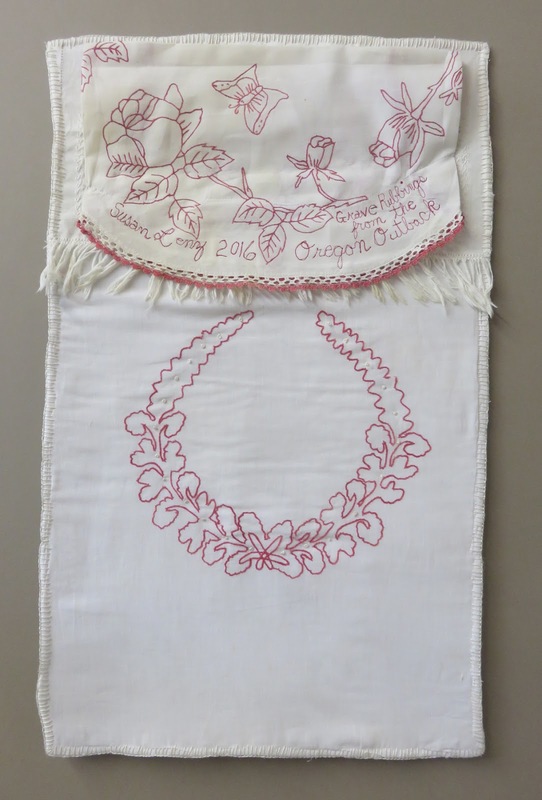 This was done to give a "second life" to the fabric, to make another useful object like a lightweight blanket or a cushion for a baby's crib. The finest examples of kantha stitching feature the entire surface covered in running stitches. This is what I am doing! I'm stacking together old, neglected, forgotten pieces of previously functional fabric. I'm densely covering the surface with running stitch. 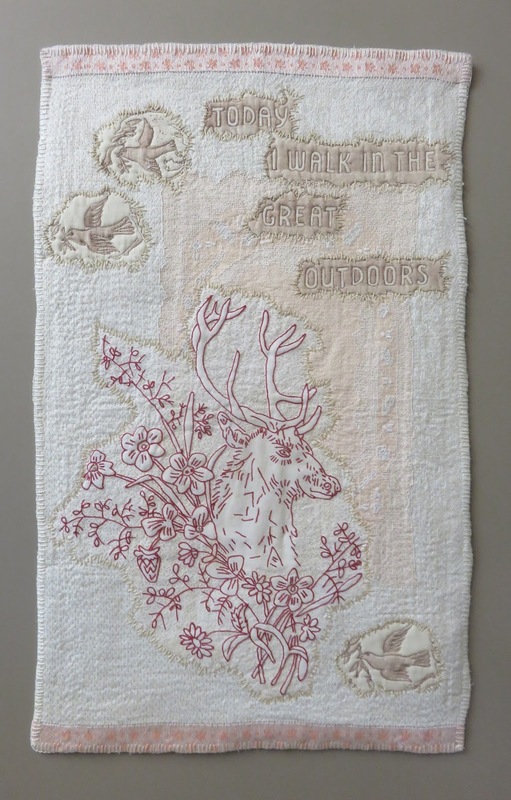 The result is a "second life", an art object that clearly reference a traditional, functional quilt ... transformed into a new work of art. 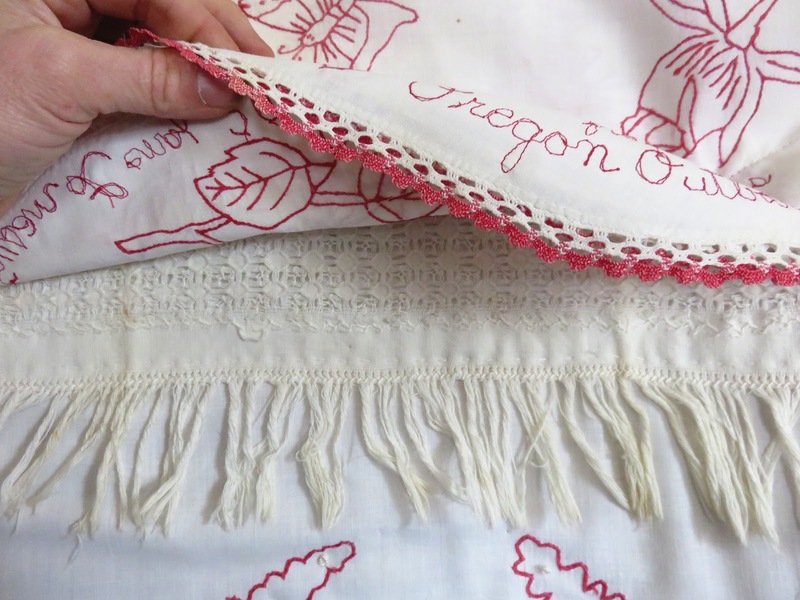 Because I have such a large stash of antique and vintage household linens, I was easily able to find other pieces with red embroidery to turn into the reverse. 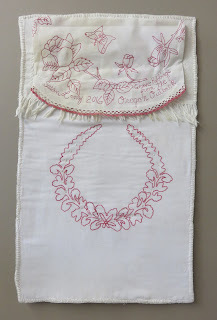 One round doily was fashioned into a hanging sleeve. 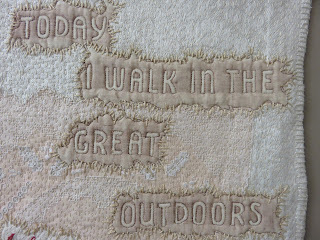 On it I stitched my name, date and the fact that the grave rubbings were made in the Oregon Outback. The pillowcase that had the red wreathe wasn't quite large enough to cover the entire back. 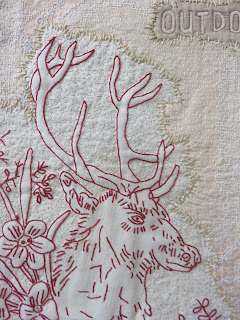 Thus, I used the other end of the guest towel that had the red deer. This guest towel was once quite beautiful. It was, however, damaged ... but not so much that it didn't work for this new piece. The fancy withdrawn embroidery and fringe was added to the top, slightly under the hanging sleeve ... where it can still be seen. I'm really pleased to have used the grave rubbings from Oregon. Thank you for this post. I have a stash of family linens that I'm always fussing with. I am always seeking inspiration as to how best work with them. Very wonderful use of vintage linens.